Utah is aptly called the outdoor Mecca for adventurers from around the world who anticipate thrilling skiing in the north and trekking deep red rock canyons in the south. There is something for everyone. Backpackers must visit each of the Mighty 5 Utah’s National Parks as it is within its borders. It is a challenge to complete the Mighty 5, starting from Zion National Park and ending at Canyonlands while spending a few days at each park. 1. Zion National Park –From Las Vegas, Zion National Park towers high above the desert around it. Hikers will experience most technical and challenging canyoneering they will ever face. For newbie hikers, start with a trip to Emerald Pools or Weeping Rock to get a glimpse of what Zion National Hiking those trails serve as foundation for the type of outdoor activities you will enjoy for a lifetime. Many hikers spent the time backpacking and canyoneering through some of Zion’s most remote deep slot canyons. 2. Bryce Canyon – After a taste of Zion, drive towards Bryce and while passing through Red Canyon and get a sneak peek of the red hoodoos shooting out of the ground to unprecedented heights. Reaching Bryce Canyon Amphitheater, you trek down the 1.3 mile Navajo Loop Trail that passes through the magical hoodoos. Spend the night under the star and be sure you have warm clothes in your pack because night camping is cold. 3. 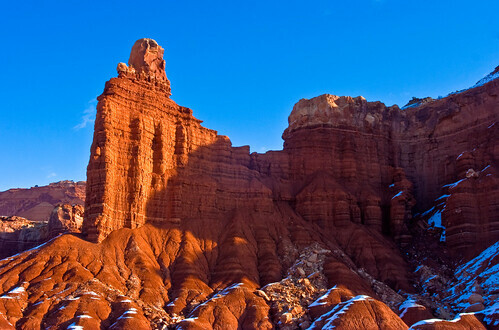 Capitol Reef – Capitol Reef National Park teems with red rocks, high cliffs, and natural bridges. Cohab Canyon, 1, 75 miles long, is one of the best hikes in Capitol Reef. A few hours away are your last two National Parks to cap your visit in Utah: Arches and Canyonlands National Parks. 4. Canyonlands is Utah’s largest National Park and is the locale of three districts each producing different kinds landscapes. Spend time near Island in the Sky and soaring high above the desert; see stunning views below of Colorado and Green Rivers. You will also enjoy spending more time at the Maze District exploring its different flavors. 5. Arches – The last stop on Utah’s Mighty 5 is Arches National Park. This place has more arches, hoodoos and towers that you can hardly count. Arches National Park is a favorite for locals and tourists alike. You can start hiking to Delicate Arch and see the most famous arch in the world. For a different flavor, head towards Landscape, Double Arch, or apply for permit to hike towards Fiery Furnace. Backpacker could easily spend a week in each National Park but they realized that they have not even scratched the surface of what this great National Park has to offer. It would be another wonderful trek next year. A great place to hang out in Utah’s National Park is in Capitol Reef so you have all the time to explore the park. For so much to activities to discover, here are the top 10 things to do in Capitol Reef. 10: Pick fruits in the orchard – Anything you pick is free for you to consume. Pay a nominal fee, take your time and bring some of your picks with you This only happens during the summer months. Check on their schedule when and the kind of fruits available. 9: View indigenous art collection on rocks – Even if you are not an art buff, you will appreciate the impressive collection of rock art left behind by the American Indian groups who lived or traveled through what is now Capitol Reef. Many of these petroglyphs are viewed just off the main thoroughfare in the park so your hike gives you a glimpse of the past. 8: Hike in Hickman Bridge – This hike is the shortest and the most rewarding. Hickman Bridge trail leads directly under this natural bridge. You have the option to walk all around or get on top of the bridge. 7: Visit Gifford Farm house – This destination is “must see”. Get a double treat for history and gastronomic treats. Historical relics remind you of the past but the homemade treats will keep you coming back. Yu can buy those yummy and delectable salsas, pies, preserves, ice creams, etc. And they usually have free samples. 6: Chimney Rock trail – This is the oldest trail in is the park. Hike all over the chimney and include canyons behind it. Check on Spring Canyon. 5: Campground in the park – The campground has everything you want in camping. It is roomy, so you can pitch your big tent, cook dinner in the designated fire pits, and play Frisbee among the shade trees. 4: The Grand Wash – This trail is for is fun and easy going hike. Mostly a canyon trail, so it is shady and ideal for the summer months. It is a wise idea to park your car at either end of the trail so you do not have to walk back as well. 3: Cathedral Valley – This is mostly a sparse desert and a lonely country. Drive to the Temple of the Sun and the Temple of the Moon, both are monolithic sandstone formations rising straight from the desert sand. 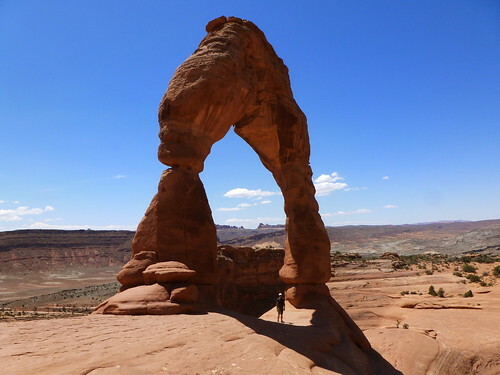 2: Cassidy Arch – This is tone of the best hikes in the park that maybe more strenuous, but definitely worth it. Get to Cassidy Arch by driving along the scenic route in the park and a $5 toll fee per vehicle. The hike climb is steep and on top of the arch, you see whole of Capitol Reef is laid out before your eyes. 1: Waterpocket Fold – Located at the southern region of the Park, it is the most fantastic section. The rocks are pushed and molded into many folds while wind and water carved narrow slot canyons into the rock. Look across and see Henry Mountain. There are many other trails and canyons to discover in your next adventure. 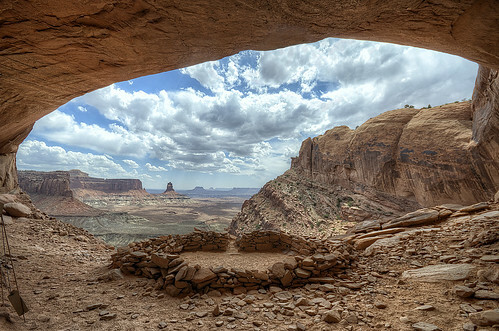 Utah’s Canyonlands are so diverse that you find beauty everywhere. As the largest national park in Utah, its grandeur is beyond your imagination. The most economical way to get there is to pass by the Island in the Sky district, located 32 miles (51.5 km) from Moab. Hiking trails and four-wheel-drive roads are easy access to the areas of the backcountry where you can spend days of adventure. 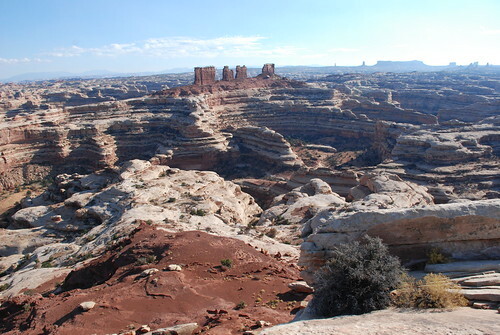 Canyonlands is divided into 5 districts each offering different opportunities for sightseeing and exploration. Island in the Sky is your initial taste of adventure as it is the nearest district. Along its scenic paved drive are several trails for hiking and a moderate four-wheel drive that takes you to White Rim Road where atop sits Island in the Sky on a massive 1500 foot mesa. Twenty miles (32.2 km) of the paved roads bring you to witness the most amazing vistas in Canyon Country. From these lofty viewpoints, you see over 100 miles (161 km) in any given direction panoramic views that covering thousands of square miles of canyon country. After you take a short day-hike and relax in the late afternoon, you cap your day watching the setting of the sun. Whether you decide to stay for a few hours or a few days, Island in the Sky provides an unforgettable Canyon Country experience for you and your entire family. The Needles is another district in Canyon Land. A distant away in the back country; Needles can be reached taking a vehicle as the distance is too far to walk. More breathtaking views are in store for you. Further in back country is the Maze. Being a remote district, you require more time and self-reliance to get there. Aside from experiencing nature’s beauty, you can see the Orange Cliffs on the western boundary. National Park and Glen Canyon National Recreation Area are co-administrators of Orange Cliffs. Located northwest of The Maze, Horseshoe Canyon is worth all your effort in hiking. Feed your aesthetic sense with the stunning Native American rock art panels. Two rivers, the Colorado and Green Rivers traverse the heart of Canyonlands as they cut through layered sandstone forming two deep canyons. These two Rivers are ideal for watersports as they are calm upstream of Confluence. You can boost your skills in canoeing, kayaking and managing other shallow water crafts. Right below the Confluence, both rivers combined their flow spilling down Cataract Canyon with remarkable speed and power. They create a world-class stretch of white water. Enjoy a flatwater trips on the Green or Colorado rivers and take a whitewater trip to Cataract Canyon. These are extraordinary thrills await the adventurers as they spent a number of days boating in the river.